Im historischen Viertel von Mendocino befindet sich im Gegensatz zu vielen so genannten "Mendocino" Inserate, die Meilen von der Stadt sind. Der Turm bietet gut ausgestattete Unterkünfte für 1 oder 2 Paare oder eine kleine Gruppe mit schönem Garten und Meerblick. Dehnen Sie Ihre Reisebudget von einigen Ihrer Mahlzeiten in der gemütlichen Küche oder zu Fuß zu einem der feinen Restaurants in der Umgebung vor. Der eingezäunte Garten schafft eine ruhige Umgebung und bietet Platz für Fahrräder, Kajaks, überwachten Haustieren und Kindern. Rauchfreie Umgebung. Besuchen Sie unsere Website (siehe unten) für weitere Fotos. In diesem Schreiben ist der nahe gelegene Botanische Garten lebendig mit Vögeln und Bestäuber. Buchen Sie jetzt für einen Sturz Wochenende, Lichterfest beginnt das Thanksgiving-Wochenende, und für Wal später im Winter zu beobachten. Geflieste Dusche, Waschbecken und WC auf der ersten Ebene. Eine zweite Tür für den Zugang von der Veranda. Der Turm befindet sich im Mendocino National Historic District, nur einen kurzen Spaziergang von Restaurants, Strände, Einkaufsmöglichkeiten, Spas, Galerien, und Wein, Filme, Pilz, Wal, und Filmfestivals entfernt. Little River Flughafen und Golfplatz sind weniger als 5 Meilen. My fiancé and I absolutely love the tower! I have been coming to Fort Bragg/ Mendocino since I was born and this is one of my most favorite places to stay! It is so clean, and cozy. 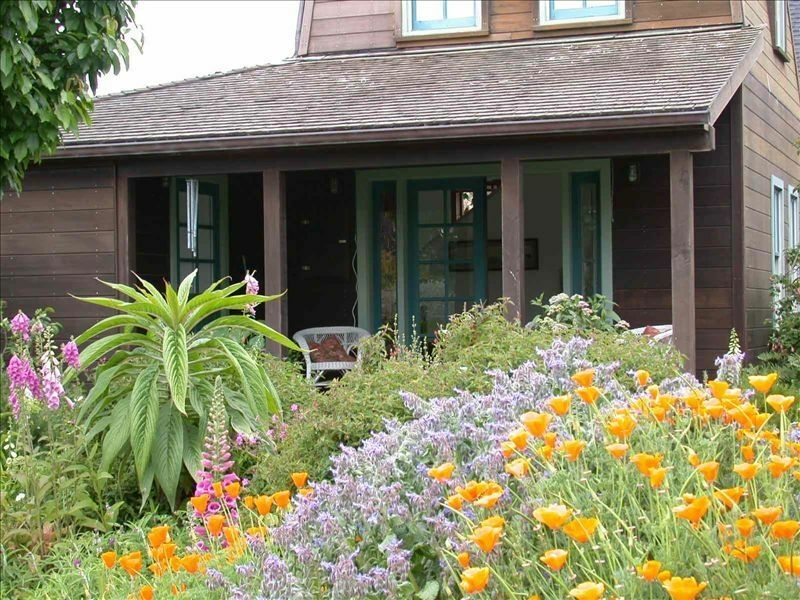 The location could not be any better, its close to the local grocery store, and downtown Mendocino! I would definitely recommend the Tower to anyone looking for a perfect vacation getaway! We really enjoyed this lovely retreat. The view from the widow’s walk is amazing and the garden is wonderful. Wendy and Robert are friendly and accommodating. Also great location. The only missing thing is maybe another chair or 2 for dining. I would highly recommend this charming place. Thank you for your reviews. We enjoyed meeting you and your family. We're glad you were able to get together in the Tower with some of the other wedding guests. Just sorry you didn't ask to borrow a chair or two since it's only equipped to host registered guests. Sweet little place, great location! The reason I gave it 4 stars instead of 5 is because we had a serious problem with ants which was a pain! I think this is probably a problem in this area because of the moisture! Also, we did fine, but if you have knee problems the stairs might be a problem, there are three stories! The owners are kind and attentive! We're glad you enjoyed your stay and sorry for the cookie-inspired ant invasion. Thank you for keeping us posted about changes in the size of your group. I hope you enjoy the Louise Penny novel. It's the first in an engaging series. Quaint, cozy and fabulous views! So glad we got to stay here for our annual mom/daughter getaway! The water tower is much roomier that it appeared in the photos- there was plenty of room for all of us to hang out together or find our own space to relax. We can’t wait to come back! Thank you for choosing the Tower for your getaway and for writing such a positive review. We're glad you had an enjoyable stay. The tower is very cute but tired looking. The weather wasn’t the best during our stay so ants were everywhere. There were also a good amount of cobwebs. WiFi wasn’t reliable, we actually didn’t use it because service was better with out- not an issue for us but if someone was working from there could be difficult. Says it sleeps 5 however additional charges per person per night after 2 people. Just lots of little things that we haven’t experienced at other VRBOs, like having to dry and put away all dishes that were used as opposed to letting them dry in the rack and having the cleaning crew put away. Don’t know if I would stay here again but it was fine for two nights. We appreciate feedback from our guests and are sorry for the dreary weather and associated inconveniences you experienced...especially with the need for rainy dog walks. We love Mendocino, rain or shine, but understand the disappointment of having inclement weather dampen a special occasion. The whole experience was perfect and amazing, very quiet and comfortable, we loved it and hope to! The yard was beautiful and the house is perfect for our small family, has everything you need. Rates are for 2 adults; add $10/night for each additional adult over 12 $50 cancellation charge up to 30 days prior to arrival; within 30 days we refund payments only for dates we are able to re-book. High season pricing applies to holiday periods and long weekends.